Shanghai SIPG is held to a 1-1 draw by J-League side Urawa Red Diamonds in the first leg of their AFC Champions League semifinal at Shanghai Stadium on Wednesday. Hulk scores the opener for Shanghai SIPG against Urawa Red Diamonds during their AFC Champions League semifinal, first-leg match at Shanghai Stadium on Wednesday night. Shanghai SIPG was held to a 1-1 draw by J-League side Urawa Red Diamonds in the first leg of their AFC Champions League semifinal at Shanghai Stadium on Wednesday night. 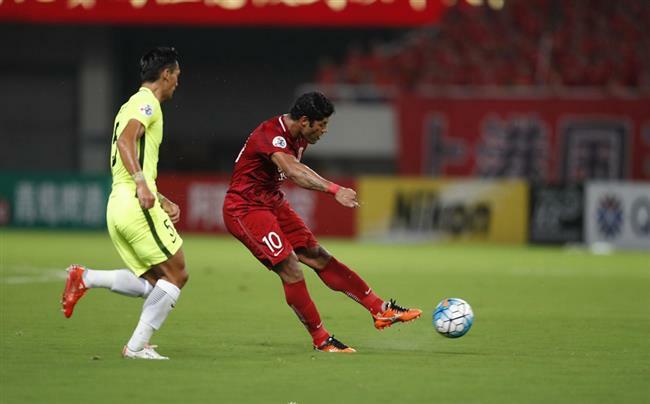 Top scorer Hulk gave SIPG the lead with a cracker in the 15th minute before the visitors leveled in the first half itself and managed to maintain that score until the final whistle. The two sides already met twice in the ACL group stage with the Chinese side winning 3-2 at Shanghai Stadium before Urawa claimed a 1-0 win in Japan. SIPG boasted an excellent home record in the ACL with 11 wins and a draw but with the side shorn of a host of first-choice defensive players, it was always going to be a tough task against the Japanese rivals. Defenders Wang Shenchao and Wang Jiajie had to miss the match after being sent off against Guangzhou Evergrande in the quarterfinals. Regular goalkeeper Yan Junling was also suspended after receiving two yellow cards in the knockout stage. Replacing Yan was 19-year-old Chen Wei, whose performance on Wednesday drew praise from Villas-Boas. Apart from Hulk, Oscar and Odil Akhmedov, Elkeson, who had been kept out of competitions by Villas-Boas for a while, was back in the starting line-up. Having wasted a chance earlier, the hosts got on to the scoresheet 15 minutes into the match when Hulk broke through Urawa’s midfield and fired a powerful shot 40 yards away from the goal, sending the ball past goalie Nishikawa Shusaku for a sensational opener. It was the Brazilian’s ninth goal for SIPG on the Asian stage — the giant striker has scored in all nine ACL matches he has played this season. Kashiwagi Yosuke claimed the equalizer for the Japanese side in the 27th. Urawa goalie Shusaku then denied two threatening attempts from Oscar in the 39th and 43rd to keep the half-time score at 1-1. Coming into the second half, Oscar’s direct freekick from the top of the box in the 69th hit Urawa’s post. Villas-Boas then replaced Elkeson with striker Lu Wenjun in the 73rd. Not many opportunities were created in the remainder of the match, though Wu Lei had a chance to seal the victory for the hosts when his one-on-one shot in the 88th slightly missed the target. Urawa head coach Takafumi Hori was, not unexpectedly, satisfied with the result. The second leg semifinal is scheduled for October 18. In the other semifinal, on Tuesday, Saudi giant al-Hilal took a giant step towards the final with a 4-0 thrashing of Iran's Persepolis in their first-leg clash in Abu Dhabi, United Arab Emirates.